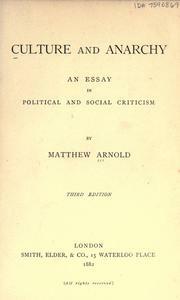 Since this blog is named after it, I thought I should devote a page to the book by Matthew Arnold. 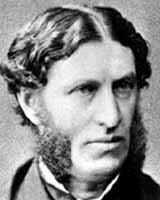 Arnold, with the splendid whiskers, was one of the Victorian greats: a poet, critic, essayist and Professor of Poetry at Oxford. Culture and Anarchy is by far his most well-known prose work today. Arnold’s crusading zeal for culture, and its concomitant civilising influence, led him to write a book about the significance of culture in society, and how it might hold back the forces of anarchy. He describes culture as the pursuit of perfection which enables us to examine stock habits and rethink things – as a way out of “present difficulties”. The Preface discusses the efficacy of the Established church to promote culture, as opposed to non-conformism, for example, which apparently takes up too much of people’s time! Culture, he says, like religion, is about seeking inward perfection. The contemporary problem is that people “worship machinery” – that is, the means rather than the end. He expresses concerns about the state as a controlling cultural power to be expected and overcome. Our “best self” – ie perfected by culture – can appreciate and accept such authority of the state as protection against anarchy. There is no doubt that Arnold was deeply snobbish about people’s approach to their “cultural life”, but he also makes some interesting and relevant points, both for understanding the Victorians and for thinking about the meaning of culture in society. Such ideas are important for the humanities subjects even now. The following quotations should give a flavour of his work.